If we could learn everything we need to know about life by playing games, living would be a breeze. I would create the “How to Wipe Your Rear End” game. I’m somewhat of an expert on the subject although I haven’t started a blog…or should I say “log”. The game would go on to be a big hit because everybody needs to know how to wipe and I would make so much money that I could finally afford to get that Steve Ballmer’s autograph I’ve always wanted. Super Markup Man is an HTML5 game where players can learn about the rules and organization of HTML markup without writing any actual code. The main character of Super Markup Man is Markup Man…shocking! Markup Man looks like what would happen if Prince William and an 8-bit Zelda made a “royal” baby. 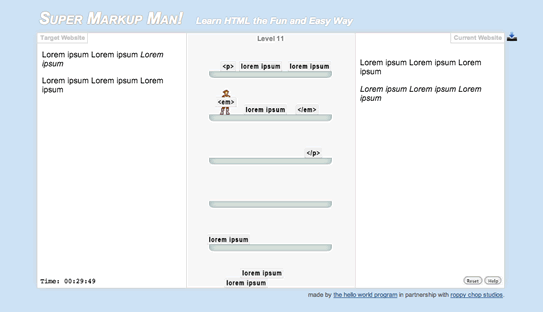 The goal of each level is to move HTML tags around using Markup Man to make the website example a reality. There are 30 levels which get more challenging as you play. The game is timed and progress is auto-saved if you leave early. It’s a very simple game that is fun to play even if you already know HTML tags. How fast can you get through all 30 levels? Feel free to post your times in the comment section. You can also learn more about HTML5 game programming thanks to this game. The game designer has made a series of tutorials to explain how Super Markup Man was built. So far he has published Part 1: The Basic Engine and Part 2: Jumping, Falling, and Stopping. The tutorials are written in an easy to understand way and include example files. You can see the future tutorials on Super Markup Man when they get posted on The Hello World Program blog. You can find out more about the studio behind the game on the Roppy Chop Studios website. Update: Play a port of Super Markup Man called Super Easy HTML Practice Game that Roppy Chop Studios recently released on Google Play (also on Amazon).